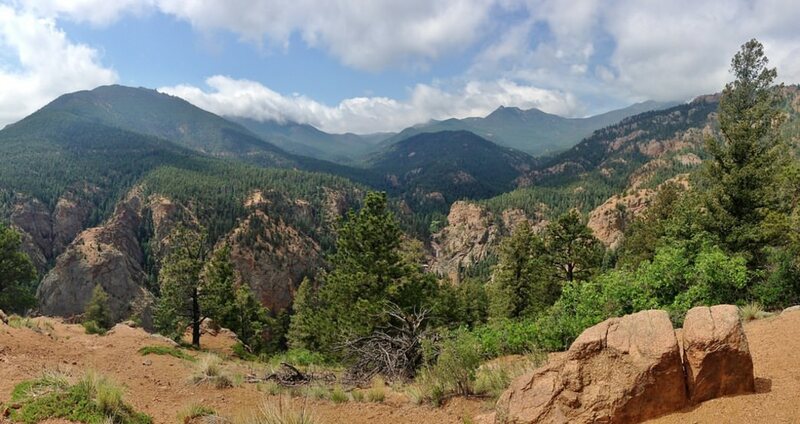 Cheyenne Mountain State Park is a popular destination for hikers, mountain bikers, trail runners, and campers. Cheyenne Mountain State Park has 16 trails totaling 20 miles. 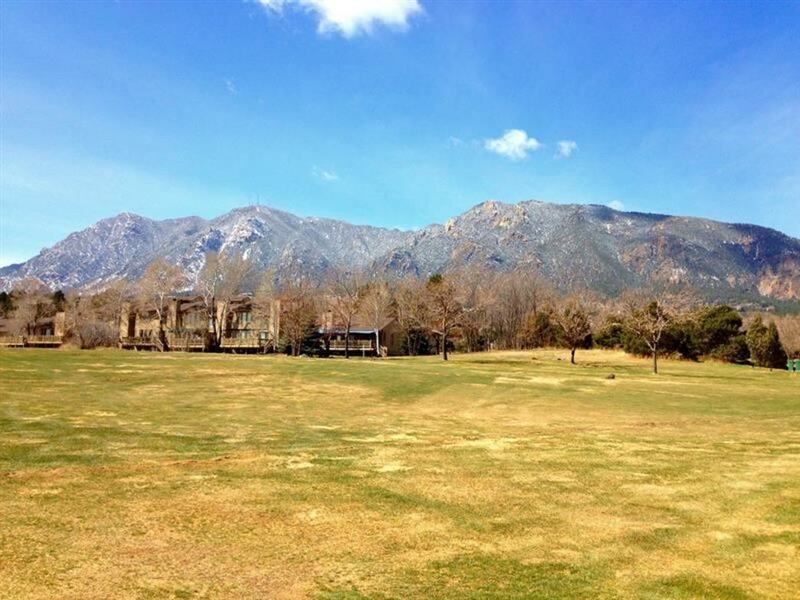 Cheyenne Mountain State Park is one of Colorado’s newest parks. It sprawls on the southwest edge of Colorado Springs, and is just across the road from the massive Fort Carson Army base. The park covers 2,701 acres and sits in a transition zone between grassland and montane conifer forest. Here, you can ride or hike through short-grass prairie, oak woodlands, and pine and fir forests, along with a small area of riparian forest. The park is frequented by mountain lions, mule deer, elk and wild turkeys. Visitors also spot prairie rattlesnakes and occasionally tarantulas on trails during the hot summer months. The park is named after the broad, round-topped mountain that provides its backdrop. Although it’s not the highest mountain in the region – that title is held by Pikes Peak – it has a distinctive place in the history of the region. In the late 1800s, miners who came to Colorado seeking gold mined small operations on this mountain but they had little success. In the following decades, the mountain was a popular tourist destination featuring cabins, a popular hotel and a ski area. 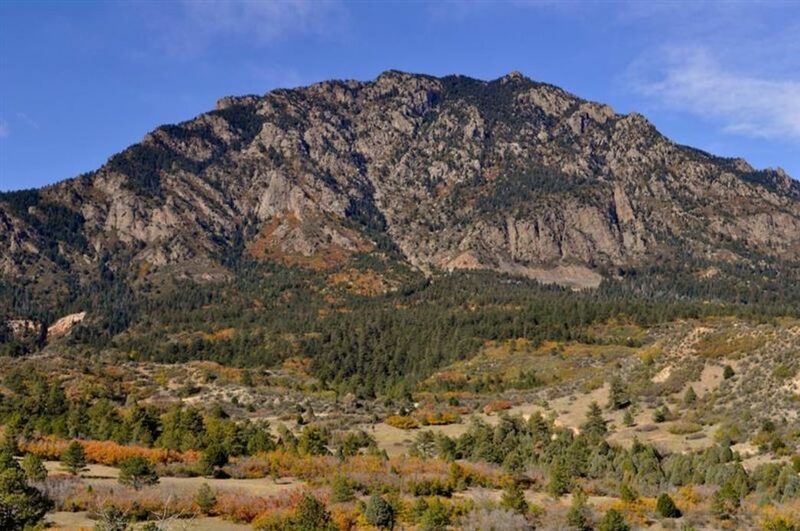 Today, the mountain holds the Cheyenne Mountain Zoo on its flank and the North American Aerospace Defense Command (NORAD) headquarters deep inside. 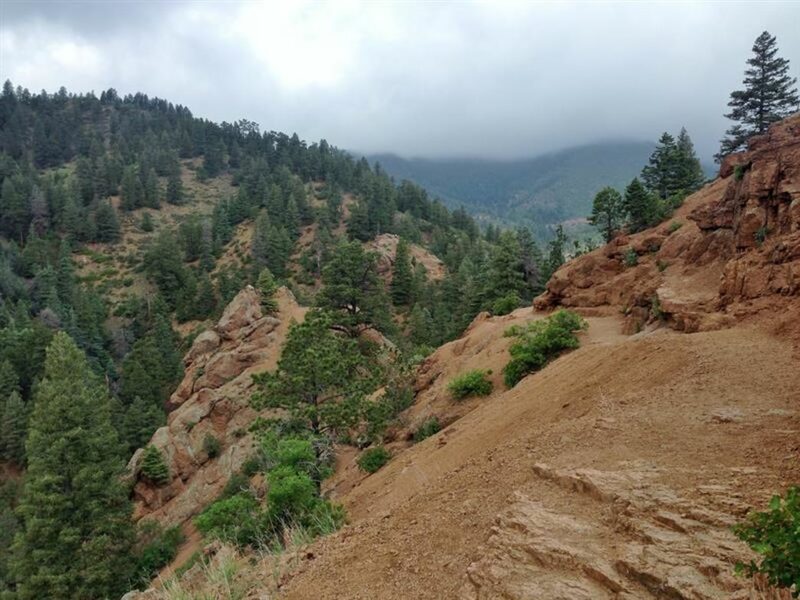 Cheyenne Mountain State Park has 16 trails totaling 20 miles; all are open to mountain bikes and hikers. Among mountain biking favorites are: Blackmer, a 3.52-mile loop that offers rock gardens; Cougar’s Shadow, a .85-mile moderate single-track; and Medicine Wheel, a .5-mile moderate single-track named for the mountain bike advocacy group that has done hundreds of hours of trail building and maintenance here. Other popular routes: Sundance, a 3.29-mile easy route with minor elevation gain, and Talon, a 2.64-mile moderate trail that starts in the prairie and heads uphill to the montane zone. 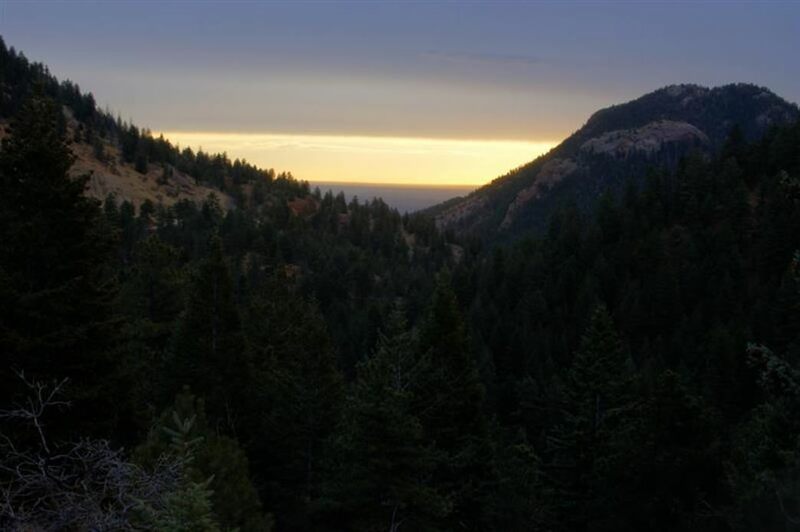 Cheyenne Mountain is also a great destination for campers, as it features RV camping and walk-in tent sites. One of the best things about living in the Pikes Peak region is the weather. Most days are sunshine-filled, and even after a big snowstorm, most trails are open. 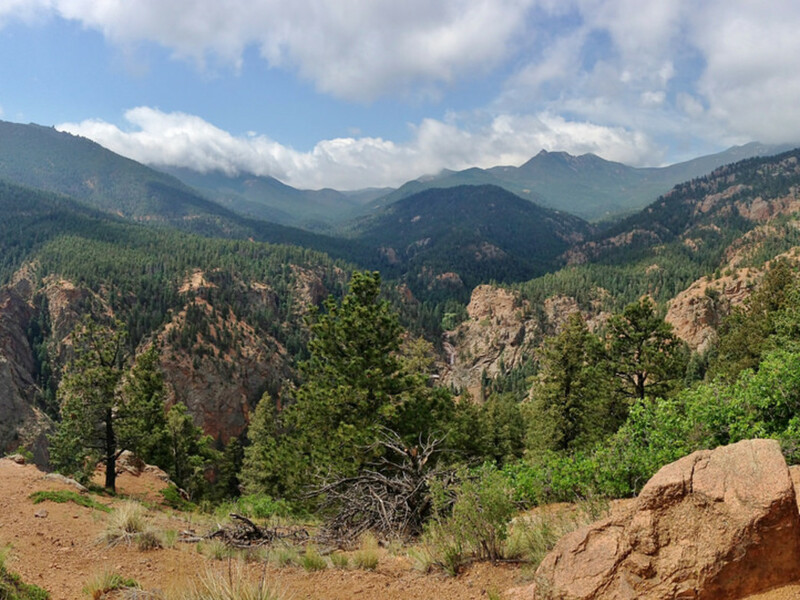 Cheyenne Mountain State Park is a wide-open space, with most trails getting plenty of sunshine. When the temperatures climb, it’s best to tackle this park in the morning. In the winter, the plentiful sunshine helps keep all but the most shaded trail sections open. Hikers or bikers that are looking for easy-moderate trails. From downtown Colorado Springs, take I-25 south to exit 135 (South Academy). Head west on South Academy and continue west to Colorado Highway 115, Turn left (south) on 115. Turn right at the first stoplight (JL Ranch Heights Road). The trails here are not open to dogs or horses. 410 JL Ranch Heights Rd.